The Cadet Program is one of the largest federally sponsored youth programs in Canada. It is a national program for young Canadians aged 12 to 18 who are interested in participating in a variety of fun, challenging and rewarding activities while learning about the Sea, Army and Air activities of the Canadian Armed Forces. Cadets also learn valuable life and work skills such as teamwork, leadership and citizenship. The aim of the Canadian Cadet Organization is to develop in youth, the attributes of citizenship and leadership, promote physical fitness and stimulate and interest in the air, sea and army activities of the Canadian Forces, all while leaving a positive life-long impact through a set of positive youth outcomes. The Cadet Program is funded by the Department of National Defence in partnership with our civilian sponsors, the Army Cadet of Canada. League members support Cadets by working in partnership with local communities and the Canadian Armed Forces. Cadet Instructors Cadre officers administer, train and supervise Cadets by delivering the program; League members (our civilian sponsor) ensure financial, accommodation and transportation support for the program and services that are not provided by the Department of National Defence. Parents and Cadets are expected to participate in and contribute to fundraising as required by the League’s local sponsoring element. The Cadet Program is open to all Canadian youth from the ages of 12 to 18 regardless of income, race, religion, culture or other socio-economic factors. The program embraces Canada’s multiculturalism and offers young Canadians opportunities to interact with youth from other cultures. The Cadet Program emphasizes key values such as loyalty, professionalism, mutual respect and integrity. Cadets also learn about fair play, teamwork and tolerance through all of their activities. Each Cadet Corps is affiliated with a primary reserve or regular force unit in the Canadian Forces and as such learn the history specific to that unit and adopt many of the traditions, culture and often aspects of their dress. The four Canadian Scottish Regiment Royal Canadian Army Cadet Corps are located in four different cities on Vancouver Island: Victoria, Nanaimo, Courtney/Comox and Port Alberni. Fundamentally each Cadet Corps is autonomous and is identified by an individual Corps number. Each C Scot R Cadet Corps has a unique history that is strongly influenced by the community in which it is located. Significant change has affected all of these Corps over the years. Very importantly, however, each is part of the ‘Regimental family’ and is either sponsored by the Regiment or affiliated with it. The C Scot R Cadet Corps have a long history of being some of the top Corps in BC. The Commanding Officer has a dedicated staff of Cadet Instructor Cadre (CIC) Officers, who administer a challenging Training Program and several Civilian and Volunteer Instructors who assist where needed. ABOUT TRAINING: Overview - Each Army Cadet Corps in BC meets one night a week from September to June. Once enrolled, an army cadet is expected to attend the weekly training night and work towards achieving one of the four star levels. In addition to the evening training, there are many weekend activities that an army cadet may participate in. These weekend activities will differ from corps to corps and may include outdoor activities or competitions with other army cadet corps. Ranks - The cadet program is designed to be led by peers. This means that cadets may be appointed to leadership positions using the rank structure of the Canadian Army. Each appointment to a higher rank brings with it increased responsibility such as dress and deportment, leading other cadets, or delivering instruction to junior star levels. Holding a Non-Commissioned Member rank teaches confidence and provides cadets with the opportunity to learn valuable skills that will assist them to become responsible young adults. Adventure Training and Expeditions - An element of adventure is included at every level of the Army Cadet program. For younger cadets, the local and zone adventure will challenge them. For older cadets the regional and national expedition programs provide progressive challenge and opportunity. Mandatory Training: star training that occurs at all army cadet corps. Commond Training (also called Directed Optional): activities that are fully funded by the Canadian Forces (CF), and include activities like competitions between different cadet units in first aid, drill, band, shooting or biathlon. Not every army cadet corps enters teams to compete, but for those that do, the costs are included in the funding for common training. Optional Training activities that receive no funding from the CF and must be raised by the local sponsoring committee. They could include citizenship tours, special banquets, recreational trips. If you are interested to hear more information, feel free to stop by to meet and talk with the Corps Staff and Cadets. They will be happy to answer any questions you may have. You can also check out the National Cadet Website and thank you for your interest in the Canadian Cadet Movement. Prior to 1968, when the unification of the Canadian Forces took place, Cadet Corps, like the “drill associations” of the 19th century that were their forerunners, were perceived “…. 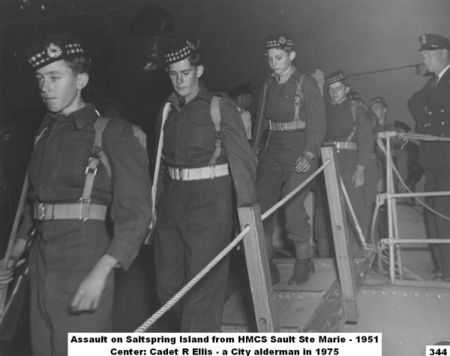 as a means of training underage young men as soldiers.” They were the direct responsibility of the Department of National Defence (Army), through the Militia and Cadet Services of Canada. On Vancouver Island they were administered by the Cadet Training Officer for Area 3 at Work Point barracks and by the Regiment. Often, former or serving Regimental officers commanded these Corps, and many officers and NCO’s were posted to them as instructors. Army cadet training was based upon Army manuals and subjects such as: Drill, Rifle, Bren Gun, map using, Battle Craft (including some Tactics and Patrolling), and Radio Procedures. Initially, Cadets were also encouraged to attend the 14 day camps for all Corps, and the seven week trades training camp which followed, in such places as Chilliwack and Vernon, BC. 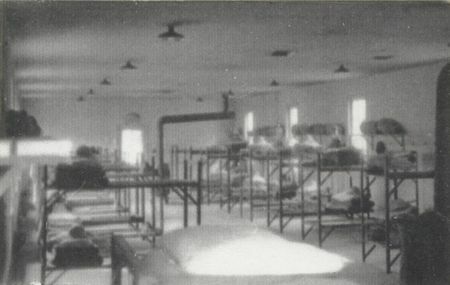 This arrangement evolved into a seven week camp, for which cadets had to apply and qualify. They started their first year in the Cadet Leader course, where they received, essentially recruit infantry training. In the following years they could progress to Junior Leadership training as a Cadet Leader Instructor where they learned instructional and leadership skills in all aspects of the training they had received the previous year. Alternatively they could select either: the Driver-Mechanics course where they were taught basic vehicle mechanics and learned to drive civilian pattern cars and vans and 3 ton trucks, as well as ¼ ton (jeep), ¾ ton and 2 ½ ton standard military pattern vehicles; or the Signals course, where they undertook basic Lineman’s training and learned the use, repair and front line maintenance of military radio sets. Finally, those cadets who had shown exceptional leadership were nominated by their Corps to attend the National Cadet Camp in Banff, Alberta, for adventure training and further instruction in leadership – a rare honour for which not all nominees were accepted. In the mid 1950’s, there were also band courses, primarily for drum and bugle bands, but also for pipe bands, were cadets could progress annually from the basics to instructor and drum major training. This concept of military trades training had several benefits. Many cadets were often invited to participate (without pay) in field exercises with their affiliated units since they had basic military skills, and could function, under the tutelage of the unit’s NCOs, like Militia solders and improve upon what they had learned. Moreover, many a cadet would be asked to fill the ranks at ceremonial parades. Cadets who had completed driver training were also in demand since their military driver’s licence was as valid as that issued to a Reserve or Regular Force driver. Qualified bandsmen were also welcomed by the unit bands, both for ceremonial occasions, and even for trips away from home. In the later 1950’s, senior qualified cadets were also employed at cadet camps as instructors, drivers and for general duties. While this practice has continued during the changes in the cadet movement, the difference was that before 1971, cadets were temporarily taken of the strength of their affiliated unit and given the rank and pay appropriate to their appointment in the camp: instructors could be corporals or lance corporals, while drivers and general duties cadets would be more likely be taken on as privates. They enjoyed the attendant privileges of their rank including the use of the Junior Ranks’ Mess. Moreover, on joining a militia unit, cadets who were qualified Cadet Leader Instructor often had their basic training requirements waived; those who had qualified as drivers, signalers or musicians could be accredited with Militia trades equivalency; and very senior cadets, especially those who had been to the Banff National Army Cadet camp, could aspire to rapid promotion to Corporal. This command structure and training regime changed dramatically following the unification of the Canadian Forces in 1968. Sources of direct funding from the Department of National Defence both to the Corps themselves and through the Regiment began to recede, forcing the Corps to find other funding sources on their own. As a result, a new funding structure had to be put into place in order that the Corps could function and the provision of funds became the mandate of the Corps’ sponsors. On the 1st of April 1971, The Army Cadet League of Canada, a civilian organization, was formed to take control of the Army Cadet Movement in Canada, which resulted in major changes in the administration and objectives of cadet training. Responsibility for cadet training became a partnership between the League and the Department of National Defence. The head office of the League works in close contact with the Directorate of Army Cadets, but, being a civilian organization, it is also entitled to confer directly with the Minister of National Defence. The Department of National Defence’s arm in the Province is the Regional Cadet Support Unit which provides funding to individual Corps for mandatory courses and some optional training, as well as officer training including rank qualifying courses and instruction for activities which require specialized supervision for cadets. The League, on the other hand, is the Supervisory Sponsor of every Army Cadet Corps and is responsible to ensure that each Corps Sponsoring Committee provides the necessary facilities and support for its Corps to operate efficiently. It also ensures that each Corps maintains a minimum enrolment and also the required complement of instructors. Corps Sponsoring Committees are vital to the survival of the C Scot R Cadet Corps. In Victoria, the Regiment continues to be the sponsor of 2136, but it is only able to provide physical space and some items of uniform for the corps, as it is not funded to do otherwise and must maintain its own tasks and responsibilities. The Regiment has supported the concept of a fund-raising parent group to assist the Corps. The Nanaimo Corps, 2422, has been housed, since the move from Duncan, in facilities at the Nanaimo Military Camp. Sponsorship was transferred from “B” Company, C Scot R, to Branch 257 of the Royal Canadian Legion (Lantzville) in 2001. In Courtney/Comox, Branch 17 of the Royal Canadian Legion (Courtney) has been long the sponsor of 1726. The Corps uses facilities provided to them at Canadian Forces Base Comox. In Port Alberni, 2308, was originally housed at the former Army Camp, and then moved to the old Glenwood Elementary School, made available by a registered society dedicated to providing accommodation for it. The Corps is currently located in the Cherry Creek Community Center in Port Alberni. Its sponsor, Branch 169 of the Royal Canadian Legion (Port Alberni), provides generous funding in support of the Corps. In addition to the support and dedication of the Corps sponsors, each Corps conducts its own fund raising activities, which include such activities as car washes, tag days and bottle drives. Nevertheless the Corps’ Commanding Officers must secure all the funds required to finance the training year and over the years have sought support from many sources. To provide additional funding, uniforms, refreshments, and extras for Corps’ functions and Annual Reviews, the four Corps have developed parent support groups. These groups are relatively informal in Nanaimo and the Courtney/Comox areas. The Port Alberni Parent Group, although not incorporated, is very active under the direction of its executive. Victoria’s Parent Group, evolving from an informal group of parents supporting the cadet pipe band, incorporated as a registered society in 1994. Over the years it has contributed considerable funds for the welfare of 2136. The Regimental Women’s Auxiliary was the major contributor to 2136 for many years after the Corps’ founding and has remained an important one. In the late 1940’s it raised the money for and provided cut-away blue tunics and kilts to outfit the Corps in a distinctive uniform. More recently the Regimental Heritage Foundation and the Endowment Fund have provided funding for major items and projects, which have benefited all the Corps. In addition to the financial support from a number of Royal Canadian Legion Branches in Victoria and other Island communities, increasing support from the Korea Veterans Association has been welcomed. Over many years the Regimental Association, too, has contributed to the Corps and has provided a number of trophies for 2136. 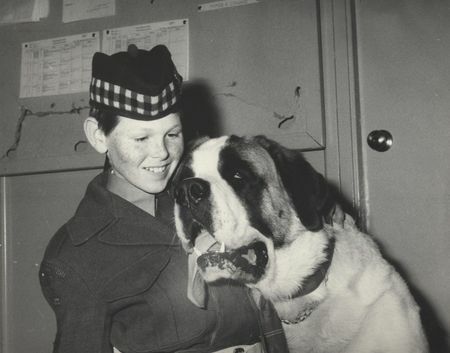 Alumni groups are encouraged by the Cadet League, but as far as it is known the Canadian Scottish Ex-Cadet Association, now named the Canadian Scottish Cadet Old Guard, is the only one in existence on Vancouver Island. Although it primarily organizes reunions, since its establishment it has assisted 2136 by supplying refreshments at Annual Reviews, and donating trophies and two trophy cabinets, among other activities. But it has increasingly become a support for all four Corps, most notably through the encouragement of inter-Corps competition through the annual drill competition award of the James Gourlay Trophy, and its support of the Corps in their efforts to standardize a distinctive C Scot R cadet uniform. With the dramatic reorganization of the Cadet Movement came an equally striking shift of philosophy pertaining to the appropriate training of the cadets. The emphasis on proficiency in basic military skills, and subsequent trades training, was shifted to the Star Level System – a system which, although previously in existence, evolved into its present form in 1970 and was fully implemented by 1974 when the new cadet training structure has been fully established. In this revised structure, cadet rank insignia still paralleled those of the Army, indicating one measure of a cadet’s progress, proficiency and capability. More significantly, a cadet’s achievement in mastering the requirements of the mandatory and optional training programs became indicated by the Star Level achieved, identified on the uniform by the colour of the appropriate Star and by special badges identifying his or her other achievements. These changes had a significant impact on annual summer training. Prior to 1974, cadets were merely encouraged to apply to attend courses for various levels of leadership or trades training: after 1974, attendance became dependent upon achievement within the Star system for their advancement. The program consists of five star levels. At the Corps level the cadet advances through each of these levels, starting with training in drill and discipline and progressing to such subjects as Bushcraft, Orienteering, Hunter Safety, Marksmanship and Public Speaking. Successful completion of these requirements at each level is essential to qualify the cadet, initially, for attendance at the two or three week summer camps, and, in subsequent years for attendance at the six week Leader/Instructor, and other, courses. With an expectation of strong evidence of leadership and self directed study, the completion of the Gold Star level qualifies the cadet to be employed as a non-instructing Staff Cadet at summer camp, while the achievement of the Master Cadet Star, leads to rewards such as advanced summer training, international exchanges and employment as a Staff Cadet Instructor at a Cadet Summer Training Centre. Another important change implemented has been the awarding of medals to cadets, which they are entitled to wear on their uniforms. Over the years a creditable number of C Scot R cadets have earned the long established Lord Strathcona Medal as well as the later Royal Canadian Legion Medal of Excellence. Other awards for which cadets are eligible include the Army, Navy, Air Force Veterans’ Medal of Merit, the Royal Canadian Humane Society Medal, and the Cadet Award of Bravery. Although there is no medal awarded, many C Scot R cadets have also earned the prestigious Duke of Edinburgh Award, based on their cadet service, community service and scholastic achievement. Initially, some members of both the Canadian Forces and the Cadet Movement expressed unease about integrating females into all aspects of both organizations. The Federal Government’s passing of Bill C-16, in 1975, insofar as the Cadet Movement was concerned, included the replacement of “boys” by “persons” in Queen’s Regulations and Orders regarding Cadets, thus mandating both the inclusion of female cadets within the Corps and the presence of female Instructors. Although not without its growing pains, as with the rest of the Canadian Forces, the presence of female cadets and staff has become a welcomed and accepted fact. As indicated earlier, from the late 1950’s to mid-1970s, cadets, usually from 2136, were often included to supplement Regimental ranks for ceremonial occasions and were often integrated and fully involved in Regimental exercises. After the mid-1970’s, however, this integration was phased out and cadets were excluded from some Regimental Activities. The major reason revolve around the fact that cadets were no longer permitted to carry weapons, thus preventing them from even parading within the ranks of the Regiment, let alone participating in field maneuvers. In addition, the cadet training program had become very different and most of the new qualifications that they received were no longer transferable to the Reserve Force. Nevertheless, whenever possible cadets have continued to participate in a number of regimental activities both locally and during some of the Regiment’s training exercises, such as 39 Brigade’s Gun Camp where they could witness, though not participate in, live fire exercises. Despite these changes, although all Corps have their unique traditions and special events within their communities, they have presented them in the context of the traditions of the Canadian Scottish Regiment. The training and Regimental experiences culminate for each Corps at its Annual review, when the cadets are inspected, are given the opportunity to demonstrate their skills for parents, the public and the reviewing officer, and the Corps presents its unique awards and trophies to its members. In addition, the Corps have represented the Regiment annually during major public parades such as Remembrance Day, Victoria Day and Canada Day, in their communities. In Port Alberni, 2308, has been the only C Scot R presence for several years. Cadets from all Corps have participated in Sunset ceremonies at the B.C. Legislature and have also represented the regiment in up-Island communities. All four Corps where present during the Regiment’s 75th Anniversary Celebrations in Victoria when it received its new Queen’s Colour from HRH Princess Alexandra. Social events such as mess dinners have provided the cadets with important ceremonial training in the traditions of the Regiment. Unique in type, number and timing for each Corps, these have proved to be important in carrying on the culture and pride of the Regiment, which has provided the historical foundation for their existence. The four Corps have all celebrated their 50th anniversaries. 2136 (1995) and 2308 (1998) celebrated their anniversaries with the participation of the other three Corps. 2422 held a special dinner to honour the occasion in 2001. Cadet pipers and drummers have been involved in the Lord Strathcona Trust Band Competitions ranking very high and winning them during the 1980’s. They have taken part in the Tri Services Ceilidhs at the Esquimalt Sports Centre and in the Regimental Ceilidh in 2001. For a number of years 2136 has provided support services for the Regimental Ceilidhs in Victoria, and have also featured its Drill Team in the 2000 Ceilidh. A number of cadets have been chosen to shoot in the marksmanship competitions held at Bisley, England, and others have earned international exchange trips. The largest group of C Scot R cadets to go to Europe did so in 1997 when Captain J. Patten arranged for thirty-three 2422 and two 2136 cadets to visit the sites where the Regiment fought in France, Belgium and Holland during the two World Wars. Moreover, in March and April of 1999, the four Corps hosted visits by a group of cadets from the Regiment’s allied regiment, the then titled The Royal Scots. Since 1948 there have been C Scot R cadets at the annual National Rocky Mountain Cadet Camp held for many years in Banff, Alberta, but relocated, in 2000, to new quarters near Cochrane, Alberta. Perhaps one of the lost significant individual honours came to Cadet Chief Warrant Officer M. Berns of 1726 who was runner-up for the national General Howard Medal for Piping in 1999 and winner in 2000. Having won recognition as the “Best Cadet Piper in 2000,” he was appointed Pipe Major of the National Cadet Pipe Band at this Camp. He was also in charge of this band when it played for the Vernon Army Cadet Camp’s 50th Anniversary reunion in July of 1999, which was attended by over 500 former Royal Canadian Army Cadets from all over Canada. Although there has been joint exercises previously, the Cadet Battalion was formed in 1981 and has operated, in order to improve and pursue common goals, such as the standardized uniform, as part of the Regimental Family. 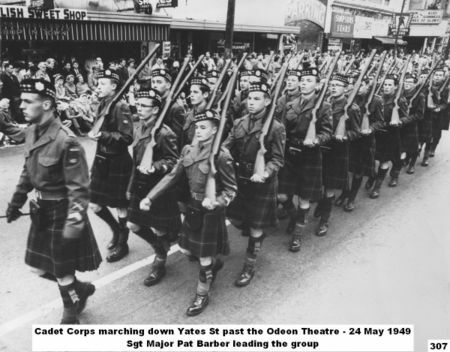 The Cadet Battalion was organized into four companies, based loosely upon the Regiment’s structure of 1954: ‘A’ Company (2136) in Victoria, ‘B’ Company (2422) in Nanaimo, ‘C’ Company (1726) in Courtney/Comox and ’D’ company (2308) in Port Alberni. It has been coordinated by meetings of the Commanding Officers of the Four Corps and has included a Cadet Liaison Officer appointed by the Regiment. Also it has received strong support from the Canadian Scottish Cadet Old Guard. The Four Corps have congregated annually to promote camaraderie and a sense of Regimental spirit at functions such as the 50th Anniversary celebrations which were held by both 2136 and 2308, but more especially to conduct joint training. Included in the training has been inter-company competition and the Cadet Battalion boasts two trophies to promote such friendly rivalry. 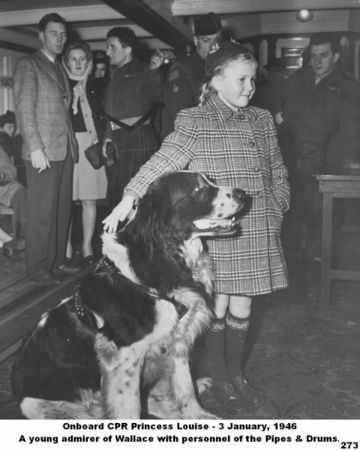 The James Gourlay Trophy was dedicated in 1959 to be awarded to the “best” C Scot R Cadet Corps on Vancouver Island as determined from the results of the Cadet Services Annual Inspections. With the changes in the 1970’s, when Cadet Corps were no longer graded for such proficiency, the trophy was awarded periodically for shooting or other competitions. In the fall of 1995, however, it was rededicated for the Corps that won a parade drill competition sponsored by the Canadian Scottish Cadet Old Guard. Although shooting competitions between the Corps have been carried out for many years, in 2001, the Canadian Scottish Regimental Association sponsored the Bert Drysdale Trophy for team marksmanship. The first Corps team to win it was 2308 in competition at the Four Corps concentration in Nanaimo in May of 2001. A major objective for the Cadet Battalion has also been the standardization of uniforms between the four Corps. Due to the fact that highland uniforms are very expensive and that they must be purchased by each Corps, many Canadian Scottish cadets must wear the issued green cadet pattern uniform. Through cooperation amongst the Four Corps, some success has been achieved in offsetting the high cost of Regimental kit: in 2001/2002 the bulk purchase of glengarries and the provision of Regimental cap badges has resulted in more uniformity amongst the Corps and enhance the C Scot R image in each community. In addition, a concerted, cooperative effort continues in order to supply kilts, blue tunics, spats and sporrans to all the Corps. The Canadian Scottish Cadet Corps have contributed, and continue to contribute to the Regimental Family. Since their founding they have assisted the Regiment in every possible way. Many cadets have filled the Regiment’s ranks as enthusiastic soldiers, NCOs and officers, and a few have gone on to distinguished careers achieving high rank in the Regiment, the Reserve Forces and the Regular Forces of Canada. The success of the Cadet training programs is very evident from the statistic that an estimated sixty percent of the personnel that form the ground element of the Canadian Forces have experienced cadet training. Since 1955, four former Canadian Scottish cadets have commanded the Regiment; two have been in its Regimental Sergeant Majors, and one its Pipe Major. Another seven former cadets have assumed command of the Regimental Corps and a considerable number have been involved in training C Scot R cadets over the last sixty years. Former Cadet M. Heppell (2136) not only commanded the Regiment, but also rose to the rank of Brigadier General commanding Militia Area Pacific from 1981 to 1985, and was appointed the Regiment’s Honorary Colonel in April of 2000. In addition, the skills the cadets have learned have contributed to many of them assuming leadership roles in medicine; law; the Public Service, education in primary, secondary and post-secondary institutions; civic, provincial and federal politics; and business. The Cadet Movement, throughout its evolution, has emphasized the importance of maintaining and balancing Regimental culture, tradition and pride with the administrative and training structure provided by the Army Cadet League of Canada and the Directorate of Cadets of the Department of National Defence. 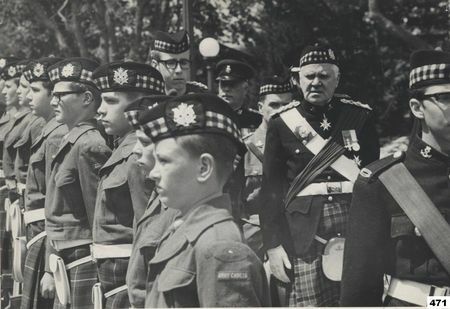 The Canadian Scottish Cadet Corps have made a huge contribution to Canadian society, and thus it is a heritage of which the Regiment and all associated with it may be justifiably proud. The Army Cadet program in British Columbia is all about adventure, excitement and challenging youth. Currently there are over 2000 youths in 49 Army Cadet Corps located in towns and cities thoughout the province.There may be a corps in your hometown. Nearly 400 adult instructors provide supervision, training and administrative support to the Army Cadets. Each corps has a sponsoring committee, from within the local community, which raises funds for Army Cadet Corps. The Army Cadet website provides insight into this dynamic program and its many opportunities. You will be amazed at the accomplishments of the youth that participate in this program. Former cadets have become successful in their chosen career or have promoted Canadian sport because of their positive cadet experiences. The Army Cadet program is a Federal Government program delivered by the Department of National Defence. The program is designed for youth who are interested in learning new skills, experiencing adventurous activities, national or international expeditions, travel, and meeting others with similar interests. ABOUT TRAINING: Overview - Each Army Cadet Corps in BC meets one night a week from September to June. Although it is best for a new recruit to join in September, a corps will usually accept recruits at any time of the training year. Once enrolled, an army cadet is expected to attend the weekly training night and work towards achieving one of the four star levels. In addition to the evening training, there are many weekend activities that an army cadet may participate in. These weekend activities will differ from corps to corps and may include outdoor activities or competitions with other army cadet corps. What does an Army Cadet do on a typical training night? Ranks - The cadet program is designed to be led by peers. This means that cadets may be appointed to leadership positions using the rank structure of the Canadian Army. Each appointment to a higher rank brings with it increased responsibility such as dress and deportment, leading other cadets, or delivering instruction to junior star levels. Holding a Non-Commissioned Officer rank teaches confidence and provides cadets with the opportunity to learn valuable skills that will assist them to become responsible young adults. Common Training (also called Directed Optional): activities that are fully funded by the Canadian Forces (CF), and include activities like competitions between different cadet units in first aid, drill, band, shooting or biathlon. Not every army cadet corps enters teams to compete, but for those that do, the costs are included in the funding for common training. Optional Training: activities that receive no funding from the CF and must be raised by the local sponsoring committee. They could include citizenship tours, poppy sales, and special banquets. The aim of the cadet organization is to: develop in youth the attributes of good citizenship and leadership; promote physical fitness; and, stimulate an interest in sea, land and air elements of the Canadian Forces. Cadets are not military members and are not expected to join the Canadian Forces at any time.